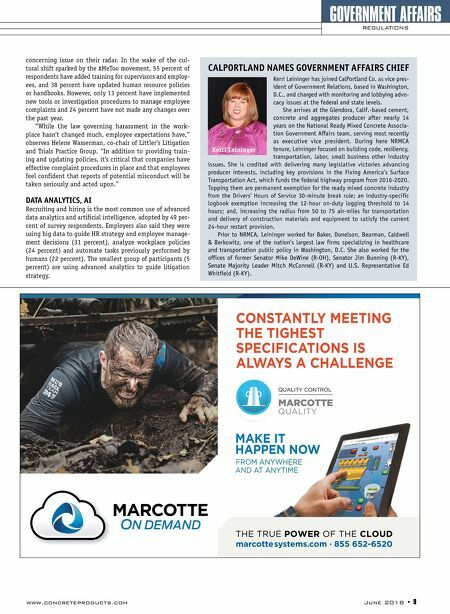 8 • June 2018 www.concreteproducts.com GOVERNMENT AFFAIRS REGULATIONS San Francisco-based Littler, the world's largest employment and labor law practice representing management, has released the results of its seventh annual survey, completed by 1,111 in-house counsel, human resources professionals and C-suite executives. The Littler Annual Employer Survey, 2018 analyzes the impact that sweeping regulatory changes and other factors, including the #MeToo movement, are having on employers. Following a year that brought several changes to workplace policy, the survey shows employers feeling some regulatory relief with the change in administration, while cautiously anticipating less of an impact from key regulatory issues over the next year. The portion of respondents expect- ing a significant impact from the Affordable Care Act dropped from 33 percent in the 2017 survey to 15 percent in 2018, with similar drops in significant concern around enforce- ment by the U.S. Department of Labor (25 percent to 16 percent) and the National Labor Relations Board (13 percent to 8 percent). At the same time, employers feel buf- feted by the burdens created by abrupt and dramatic regulatory changes, slow-moving confirmations to key government agency posi- tions, and the growing patchwork of state and local labor and employment requirements. The majority of respondents (64 percent) said that reversals of workplace policies and regulations between presidential administrations put a strain on their businesses and 75 percent said they faced challenges as states and localities work to fill perceived policy vacuums at the federal level. "Companies want certainty more than anything," says Michael Lotito, co-chair of Littler's Workplace Policy Institute and past presenter at the National Ready Mixed Con- crete Association ConcreteWorks Conference. "The vast majority of employers want to comply with the law[;] the continuous rever- sals of federal workplace policy, as well as the increasingly fragmented and sometimes contradictory rules at the state and local level, is an enormous distraction for them. Uncertainty means inability to plan, budget and anticipate, and it requires constantly retraining employees and reformulating employment policies." Of the changes that occurred during the first year of the Trump administra- tion, respondents identified the rollback of wage-and-hour policies (62 percent) and the Tax Cuts and Jobs Act (62 percent) as the areas that have most significantly impacted their businesses. IMMIGRATION REFORM Amid tightening regulation and enforce- ment of both legal and illegal immigration, employers expect a range of immigration-re- lated changes to significantly impact their workplaces over the next year. Tighter restrictions on visa adjudications, such as those for employees with specialized skills and temporary workers, was the top concern selected by 48 percent of respondents. More than a third (36 percent) expressed con- cern with increased workplace immigration enforcement by U.S. Immigration and Cus- toms Enforcement and associated agencies. 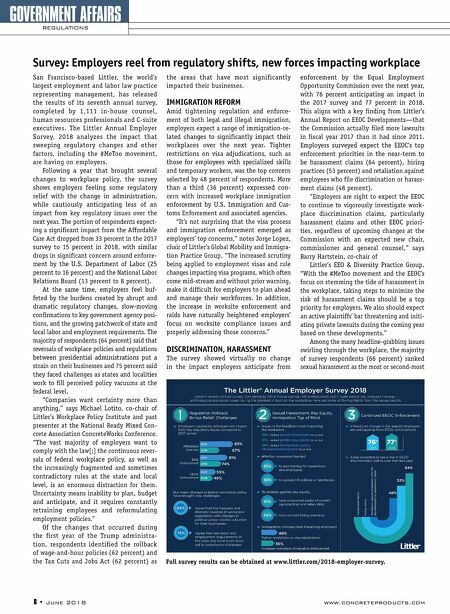 "It's not surprising that the visa process and immigration enforcement emerged as employers' top concerns," notes Jorge Lopez, chair of Littler's Global Mobility and Immigra- tion Practice Group. "The increased scrutiny being applied to employment visas and rule changes impacting visa programs, which often come mid-stream and without prior warning, make it difficult for employers to plan ahead and manage their workforces. In addition, the increase in worksite enforcement and raids have naturally heightened employers' focus on worksite compliance issues and properly addressing those concerns." DISCRIMINATION, HARASSMENT The survey showed virtually no change in the impact employers anticipate from enforcement by the Equal Employment Opportunity Commission over the next year, with 76 percent anticipating an impact in the 2017 survey and 77 percent in 2018. This aligns with a key finding from Littler's Annual Report on EEOC Developments—that the Commission actually filed more lawsuits in fiscal year 2017 than it had since 2011. Employers surveyed expect the EEOC's top enforcement priorities in the near-term to be harassment claims (64 percent), hiring practices (53 percent) and retaliation against employees who file discrimination or harass- ment claims (48 percent). "Employers are right to expect the EEOC to continue to vigorously investigate work- place discrimination claims, particularly harassment claims and other EEOC priori- ties, regardless of upcoming changes at the Commission with an expected new chair, commissioner and general counsel," says Barry Hartstein, co-chair of Littler's EEO & Diversity Practice Group. "With the #MeToo movement and the EEOC's focus on stemming the tide of harassment in the workplace, taking steps to minimize the risk of harassment claims should be a top priority for employers. We also should expect an active plaintiffs' bar threatening and initi- ating private lawsuits during the coming year based on these developments." Among the many headline-grabbing issues swirling through the workplace, the majority of survey respondents (66 percent) ranked sexual harassment as the most or second-most Survey: Employers reel from regulatory shifts, new forces impacting workplace Full survey results can be obtained at www.littler.com/2018-employer-survey.